Deputy Prime Minister Vuong Dinh Hue on November 3 received a French business delegation led by Thierry Mathou, Director for Asia at France’s Ministry for Europe and Foreign Affairs. The delegation, comprising nearly 50 leading entrepreneurs, came to inquire into investment opportunities in Vietnam on the occasion of the official visit by Prime Minister Édouard Philippe. Deputy PM Hue said the business delegation’s visit creates a chance for the two sides to listen to each other’s opinions and work together to further increase investment cooperation between the two countries. He noted that while the Vietnam-France political relation are growing well, economic and commercial ties remain modest, with two-way trade accounting for just 1% of Vietnam’s total foreign trade in 2017. Thierry Mathou said Party General Secretary Nguyen Phu Trong, during his visit to France in early 2018 had agreed to increase France’s presence in Vietnam, which is the reason why the French Prime Minister and businesses have come to Vietnam. Firms operating in various fields such as energy, infrastructure, health care, information technology and also startups want to work with Vietnamese counterparts for mutual development, Mathou said. Representatives from French businesses said bilateral economic partnership can further grow, adding that France has sufficient experience in fighting fake goods, intellectual property, health care, digital technology and smart city to cooperate with and invest in Vietnam. The Vietnamese Deputy PM welcomed the intention to invest in Vietnam of French businesses. 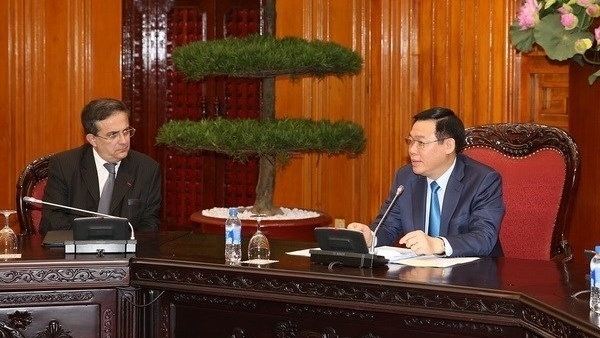 He informed them that Vietnam has recently reviewed 30 years of implementing the policy on attracting foreign investment and is making strategic adjustments to the policy, with the aim to draw investors with modern and environmentally-friendly technology, who are ready to connect with Vietnamese businesses to create global production chains. ”Vietnam wants to learn from France’s experience and cooperate with the French Government and business community,” Deputy PM Hue said, stressing that the success of French firms in Vietnam is also Vietnam’s success in economic development. The Government official also asked the French business community to use its influence to advocate the early approval of the Vietnam-EU free trade agreement.